Your blogroll is miles long. You can't remember the last time you made it through your entire Instagram feed. And let's not even get started on all of the yet to be listened to podcasts, newsletters sitting in your inbox, and articles you've bookmarked in the hopes of reading later. Sometimes there is so much noise in our lives as we are bombarded by information that it becomes impossible to sort through it. How can you truly process and digest what you have access to without becoming overwhelmed and paralyzed by the information you are inundated with? Here are some simple strategies to help you cut through the fluff and concentrate your consumption on what is truly valuable to you. With the incredible access that technology affords us to opinions and ideas and information it can be appealing to attempt to consume it all. Reading articles, watching videos, and clicking on every Pinterest post may give us feelings of being well informed and well read, but how much are we actually retaining? My guess is not a whole lot (I did attempt to find some studies on reading retention rates, but it seems the scientists are quite conflicted). If that is the case, it only makes sense that we must set priorities to consume and retain that which is most important to us. For example, if you are a blogger there is no way you can read every article out there about blogging. What you can do is instead set a priority to focus on reading articles about planning editorial content. Once you feel more confident with that subject, select another, and so on. As we continue to grow and evolve, our interests and priorities change and our habits should follow accordingly. It is so, so, SO easy to hit a follow/subscribe button. If you watch a fun video on youtube or read a good blogpost it does not mean that you have to become a follower! Sometimes it is enough to simply view something and appreciate it without committing to the creator. If you are more selective in who you choose to follow you will find that you are less overwhelmed by mediocre content and can focus on being inspired by the people/brands/creators you truly love. Sometimes it may feel as though if you are not up to date on every new artist and event and blogger, then you are behind. But if we're really honest, so much of what we consume quickly falls to the wayside and becomes irrelevant. For that reason, it is clear that we don't have to put pressure on ourselves to know and read everything. Rather, we can be selective in what we consume, delve deeper into the subjects we are passionate about, and be comfortable knowing more about less. Choose a few newsletters, blogs, and creators you enjoy and selectively supplement those as you see fit. 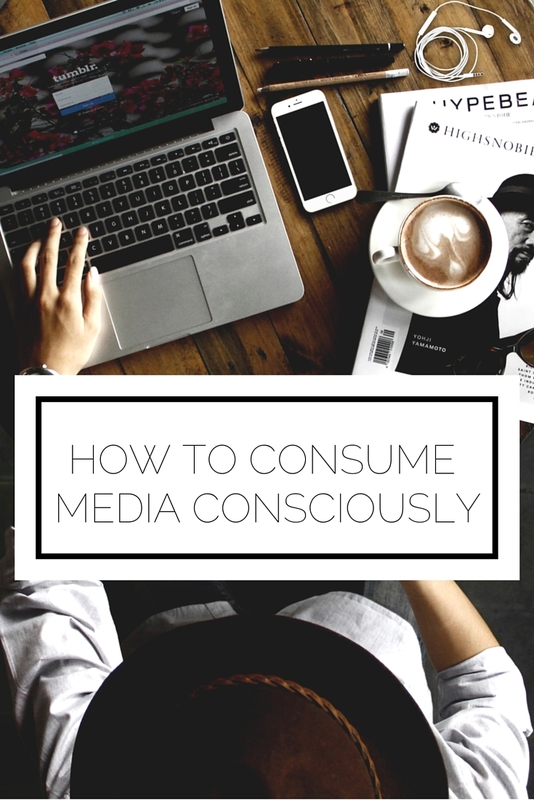 With these tips you can bring greater clarity and focus into your consumption habits and feel rejuvenated and inspired, instead of overwhelmed and drained. Take some time today to reevaluate who you follow on social media, what news outlets you are subscribed to, and take back control of what you give your attention to. How do you consciously consume?